Six years ago, Arie Luyendyk Jr. was in love and a day away from proposing to the woman of his dreams. And then, she broke his heart. Emily Maynard (now Emily Maynard Johnson) may not have been Arie’s future wife, but he hasn’t been able to find a love like hers since. Now Arie is back and ready to race into America’s heart yet again when he returns for a second shot at love, starring in the 22nd season of ABC’s hit romance reality series “The Bachelor,” returning to ABC in January 2018. After a tearful exit on Emily’s season of ABC’s “The Bachelorette,” Arie has stepped away from the spotlight and focused on his new career in real estate, which has brought him tremendous success. Even though he has been gone from Bachelor Nation, America hasn’t forgotten Arie’s rugged good looks and charm. After mending his broken heart, Arie is finally ready to start his own journey for love. At 36, he’s definitely older than most Bachelor contestants. Bachelor creator Mike Fleiss explains the show’s success today in an interview with Entertainment Weekly. Shorter version: The Bachelor owns the romance field, everyone else can just step aside. He’s right about that. EW: Reality Steve spent most of the season predicting that Chantal will be the winner. Once he owned up to being wrong, fans crowed that he had been `Fleiss’d.’ Did you or anyone involved in the show feed him misinformation? FLEISS: I wish I could take credit but he duped himself. He’s nuts, a goofball. He says these things with 100 percent conviction but he’s right only half of the time. It doesn’t matter that much to us, it’s just that he acts like he knows everything. He’s the Michele Bachmann of reality TV facts. But the leaks are not really coming from production. They’re coming from former cast members. That’s a hard thing to police. The best way to combat him is to let himself shoot himself in the foot. 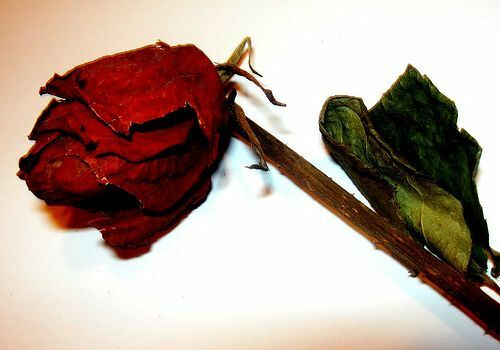 The Bachelor season ended not with a romantic proposal, a twirl, and declarations of undying love, but with a breakup. It was no secret Brad would propose to Emily and she would accept. The question was going to be, are they still together? The final rose ceremony was filmed in South Africa on November 19. The “After the Final Rose” show taped last week, which means while both aired tonight, one occurred four months after the other in real time. A lot can happen in 4 months. As soon as the ATFR began, Chris Harrison, looking tired, stressed or botoxed, take your pick, announced that the couple had already split once since leaving South Africa, and hadn’t seen each other in the past month. Later, Chris throws in another bombshell: Brad and Emily were supposed to get married on the ATFR show, which had been planned to film in Anguilla, where the couple fell in love. But Emily called it off. Chantal came out first, looking terrific in red, then Brad came out, and Chantal, like the good-sport she is, asked the pertinent questions aimed at getting closure. It didn’t go the way she wanted. Emily also looked beautiful, with a new hairdo in a darker blond (or maybe just added lowlights) and a shorter cut. We also got to see she has a personality, something the show tried to hide all season. She was tough, spontaneous, and funny — who would have guessed? She complained about her “edit” — the boring, poised lady edit — and insisted that if she had gotten the dates Chantal got, she would have had fun too. Every season, the day after the airing of the Final Rose ceremony and After the Final Rose show, the happy couple from the Bachelor/Bachelorette do a teleconference call with the media and answer questions. When they are done, the rejected Final 2 contestant comes on the call to answer questions. Another staple every season: The happy couple begins their media tour right after the final show. Usually, they go on Jimmy Kimmel Live, and then a morning show. Then they hit the talk show circuit. Within a few weeks, they fade into obscurity as attention focuses on the next season. The first sign of trouble in paradise came earlier this week when ABC posted its press release of the post-show teleconference. 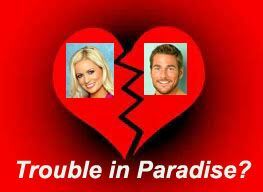 Brad Womack and the woman he chose, whom everyone says is Emily Maynard, will not be on the call. 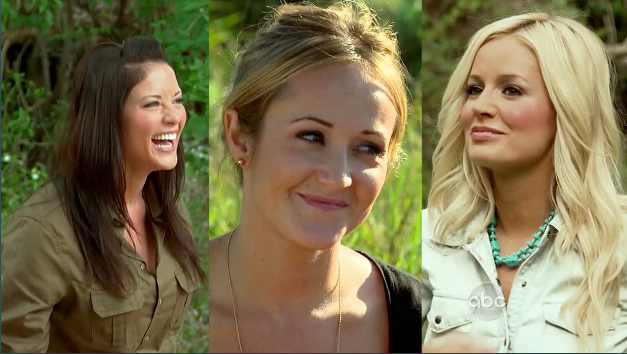 Instead, host Chris Harrison will be on the call to talk about them (translation: dto do damage control.) After that, Brad’s rejected F2 (Chantal O’Brien) will answer questions. The second sign of trouble was learning that the couple won’t be on Jimmy Kimmel Live after the final show airs. Instead, he’ll be announcing the next Bachelorette. TV Grapevine has an extended video of Bachelor Brad Womack as he brings Emily Maynard and Chantal O’Brien to meet his family and on the last chance dates. It’s pretty obvious from the video that Brad is telling Emily she’s the one. He keeps saying he wants to be Ricki’s real father. It’s also pretty obvious that Chantal knows on the last chance date that Brad is not choosing her. (Its usually the F2 who gets the shark date. ) I think she has known since their treehouse date — another unromantic date (Outdoors, lots of bugs, no jacuzzi, no real bathroom, no luxury. It was worse than a camping date.) Props to Chantal for being the good trooper and going through with the Final Rose Ceremony knowing she was being rejected. I’m not surprised she turned the Bachelorette part down, even before she had a new boyfriend. The show was not kind to to her in the editing. Ashley Hebert, who will be announced as the next Bachelorette on the Jimmy Kimmel show Monday night, is a disappointing choice for the role. All we can do is hope the guys are worth watching in her season. Bachelor Brad Ending: Who Makes Him a Better Person? Emily is one in a million….the person I am around Emily, I’m a much better person. I’m myself, but a much better self. Game over. Congratulations, Brad and Emily. Oh, no. After believing Reality Steve all season that Brad Womack’s final rose goes to Chantal O’Brien and the couple are happily engaged, he now tells us he was wrong and Brad is engaged to Emily. He also says Chantal turned down the Bachelorette gig for next season, and that’s how we end up with Ashley in that spot. RS says it doesn’t matter why his sources were wrong. I’m not convinced of that. I think people will still follow his spoilers in future seasons, but no one will rely on them. They will be just another piece of the puzzle. Which is a good thing, because sleuthing the seasons, as they do at FORT, is the most fun. The final question: Is this latest spoiler from RS what really happens? At least RS copped to his mistake, didn’t try and pass blame and apologized to those affected, from Brad to Chantal to readers. And thanks to FORT for breaking the new ending over the weekend. Reality Steve says Ashley will be the next Bachelorette — apparently Emily didn’t want the gig. Definitely no “wow” factor in that choice, but maybe the dates, locations and guys will be great. One can only hope. The best part of Reality Steve’s latest column is the description of the casting process, provided him by one of the contestants from a former season. Psychologists, private investigators, blood and urine tests, 1000 questions and total seclusion. I’m surprised there are enough people willing to put up with it. Bottom line: No one would go through all that for a chance at love with a stranger. They would only do it for a shot at fame and fortune. Just another sign this show is far from real. I’ll bet Ashley is about to get inundated with offers from clothing stores to provide her with outfits and jewelry to wear on the show. What she really needs is a great hair stylist to cover up her incredibly big forehead. It’s so distracting, and reminds me of Herman Munster. Sports Illustrated tried here, but a comb-over isn’t enough. The “Women Tell All” episode tapes today in L.A.
Next Monday on The Bachelor, Emily reveals her sad history and one contestant decides to call it quits. Who goes home? Madison (the woman with the fangs). Brad Womack, for those that watched his first stint as The Bachelor, know he can be a pretty uptight, serious guy. Watch him here, in this interview this morning, and you’ll see how he’s changed. He’s looser, happier, and practically giddy about having found love. It’s also refreshing to hear a Bachelor/ette with a vocabulary that contains a word other than “amazing.” In discussing the 30 women on the show, he uses phrases like “bold personalities.” He’s also very complimentary to all of them. Tonight Brad was on Jimmy Kimmel Live. He was just as happy sounding as in the interview clip above. He also revealed he didn’t sleep with any of the women while on the show. I’ve always thought of Brad as a pretty straight shooter. I hope this new love works out for him. conniegl6 on Bachelorette: Roberto, Chris or No One? All content copyright 2009-2018 by PopLeft.com. Reprint only by permission.